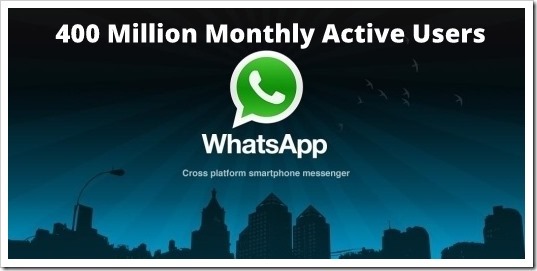 WhatsApp's Meteoric Growth: 400M Monthly Active Users, 100M Added In 4 Months! WhatsApp rise has been meteoric to say the least, especially in last 12 to 18 months. The latest numbers announced by WhatsApp on their blog may astonish you – They now have crossed 400 million monthly active users out of which around 100 million have been added in last 4 months alone since August when they had 300 mln users. More importantly, this number is not based on people who have registered with WhatsApp, but people who are actively using it every single month. What is even more interesting is the fact that WhatsApp has scaled to such phenomenal numbers with just a 50 people team. Have you ever thought why WhatsApp is so popular? There are multiple factors, but in my opinion, the 2 biggest factor for WhatsApp success are privacy and simplicity. We are in an era where we have dim-o-dozen mobile messaging apps. while few of them are doing well, WhatsApp has gained standout popular – The reason is, even your grandma can send and receive messages with ease. Everything just works perfectly and unlike many other apps, they have kept it free from ads. It is fast, simple and intuitive! The second reason is privacy – everyone has heard about horror stories on Social media platforms where privacy issues have bought an individual into a soup. With WhatsApp, those chances are nearly nil – whether you are chatting with individuals or in a group, the sender knows exactly to whom and what it is going. No one else can see the messages. In addition to this, what I like about WhatsApp is that they have not ventured out to add more and more features. They have kept it simple and stuck to one aspect – rich multimedia messaging. They have not got into video-conferencing or VOIP like many others have done. They have been only focused on improving the messaging aspect of it. And their accelerated growth has come about due to network multiplier effect – Where more people joining in, bring in even more people along with them. Interestingly, WhatsApp has never advertised big like their competitors – They have relied on their users to bring in more users and word of mouth publicity. What has helped them, especially in India, is the fact that mobile internet and smartphone growth has risen drastically over past 1 year. Many Facebook users have now moved to WhatsApp for communicating with their friends and family rather than doing it on Facebook. If WhatsApp growth rate remains for another 6 to 12 months, they may be a real threat to Facebook (if not already). While it may be a threat to Facebook in future, they have already put a death knell on traditional SMSes. What do you think? Do you think WhatsApp can grow to a level where they can take on the mighty Facebook?